Yes, we know that we live in a global world. But we sometimes forget that the people who might help us most with our business – or business loan – are right around the corner. Those are the relationships that ArgoFund is there to facilitate. They prepare small businesses to build productive relationships with community banks. You know – the guys who keep money local, pick up the phone when you call, and work transparently to give you the best value possible because they cherish your business. They still exist, and this is how to get to them. Somewhere in the rush to make business financing easier, faster, more clickable, that bank got drowned in a pile of pixels. Things got faster – and expensive, too. ArgoFund helps you find a proper, local bank that suits you and your business. But before they do, they help you to get organized – then puts you right in front of a bank that wants to see you as much as you want to see them. And you’ll be ready. 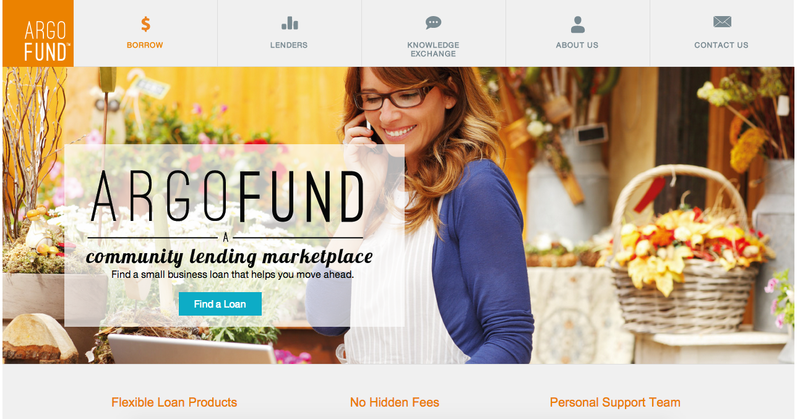 Cofounder Erick E. Pereda tells us more about this community lending marketplace that’s out to help small businesses. Thousands of neighborhood based community lenders have a mission and need to underwrite, fund and service small business loans in-house. But their customers are increasingly going online for fast, and expensive money. That’s not always the right money. We prepare small businesses to build productive relationships with the local lenders (banks, loan funds and credit unions) that keep local economies humming. Our sophisticated platform prepares and drives quality small business loans exclusively to local lenders for long term, local, and responsible relationships. At the same time, we provide community lenders access to a qualified pool of borrowers that fit their individual lending criteria. In an online world that increasingly focuses only on convenience, we help borrowers find the right local loan, saving time and money, while keeping an eye on the long term prize. We focus on responsible, relationship based lending – bringing small business back from the “outer space” of online alternative lenders and re-connecting borrowers with neighborhood institutions back “on Earth.” We save everyone time and money, in a market that increasingly focused only on convenience at the long term expense of all. There are over 7,000 of these lenders in the U.S. that are ready and willing to lend to small businesses. But they have trouble reaching new customers, and their borrowers are increasingly going online. ArgoFund makes the connection. Our banker-approved platform captures the lenders unique requirements and matches borrowers. We screen each applicant to meet specific criteria, even when those criteria change. This ensures lenders receive high quality applicants. The ArgoFund platform also provides a comprehensive dashboard, together with live summary notifications where loan officers can easily view application details and analytics. Improving time and cost efficiencies is the soul of our business. We are targeting the over 7,000 Community Banks, Credit Unions and CDFI lenders nation wide with loan originations over $600 Billion. The largest market by small business lending volume and concentration of lenders is the New York metropolian area, followed by Chicago and Los Angeles. We are targeting these markets in this order first. Thereafter, we will rapidly expand to other national and international markets. In North America, we will earn revenue by sharing a percentage of the loan origination fee with the lender. In addition, the secondary market service will deliver revenue through a fee for each transaction. Finally, we plan to offer loan servicing to smaller lenders, with revenue from a portion of the interest earned. Are the days of one stop banking at the behemoths done? We believe the large banks will continue to serve their larger corporate business customers, while the gap for small and medium business will be served by Community Lenders as the economy continues to shift back to local sourcing. 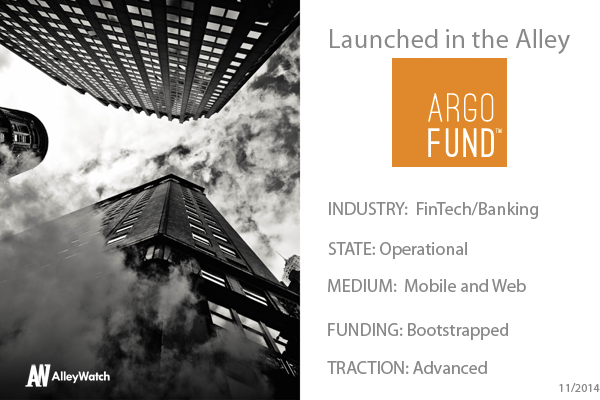 Our objective is to sign up an initial set of 50 community lenders in metro NYC, service originate 100 small business loans through the ArgoFund platform, setup scalable customer support operations and sales processes, and continue to evolve platform security. James D. Robinson, and the team at RRE. Because of their early experience in driving alternative funding online. New York represents the largest volume of small business loans and highest concentration of community banks. It is our largest market in the most concentrated geographic area, and our team has been working and building relationships within the banking and investment community for years. Now that winter is here, what favorite summer time beach destination close to NYC are looking forward to for next year? Brighton Beach – pierogies and boardwalk all in one place.